An old road that is rapidly degrading into single track trail that climbs onto the flanks of the Grey Rocks, acesses large and unappreciated Grey Rock Meadows, a secluded alpine garden. The Grey Rocks Meadow Trail provides access to the south side of the Grey Rocks Grey Rock Meadow, and Flume Creek Ridge. The route generally follows an old road that has degraded to little more than a single-track trail in many places. Other than rare OHV use, especially during hunting season, the route sees almost no traffic. 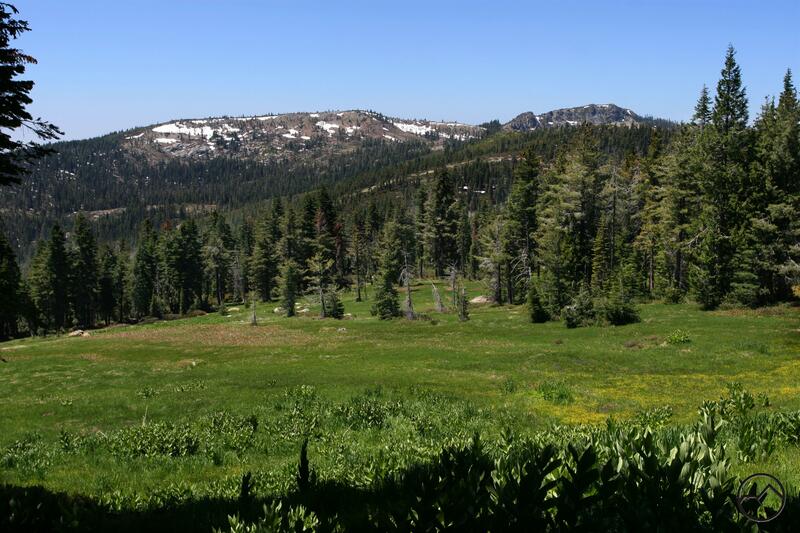 Like most trails in this area, the trail to Grey Rock Meadow offers excellent views as well as the opportunity to explore the enormous meadow that boasts extensive patches of Darlingtonia, a carnivorous plant common in the Klamath Mountains. 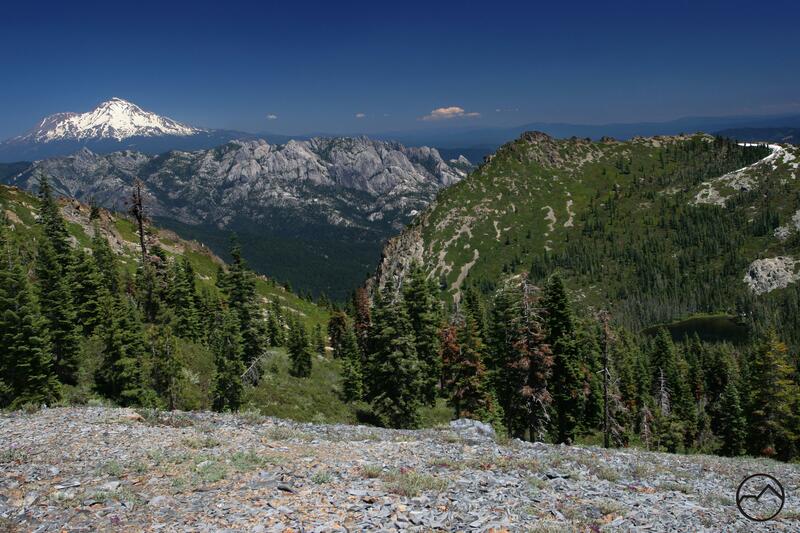 A nearby vista overlooking the Castle Crags and Mount Shasta looming in the distance is one of the finest spectacles in all of the Trinity Divide. The first view of Grey Rock Meadow. he trail begins at a spur off of Forest Road 38N17. Park where a new road splits off the spur and heads to the north. Continue on foot up the spur. The road remains in acceptable condition for about 0.2 miles until it crosses a small creek. At this point the road degrades considerably and is essentially a wide, rocky trail. Beyond the creek the trail climbs up to a pass between two small subpeaks of the Grey Rocks. A use trail leading to the south climbs up to Peak 6,308, where one has good views of the Grey Rocks. The pass marks the divide between the Trinity River watershed and Sacramento River watershed. After passing through the pass the trail continues on a long, level traverse of the lower flanks of the Grey Rocks. About 0.5 miles past the pass, the trail forks. If one continues to the right, the trail turns south. 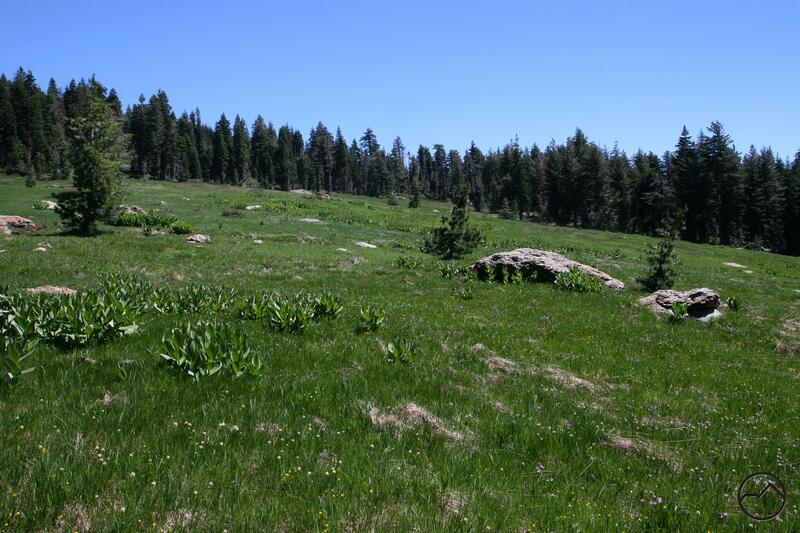 From there it passes through some lush meadows and then crosses back over the divide to Tamarack Lake. Looking south toward Baker Peak from Grey Rock Meadow. Staying left at the fork, the trail turns sharply to the north. A short side-trail leads to the foot of Grey Rock Meadow. The meadow is well watered by a series of springs on its north end. Large bogs of Darlingtonia, a carnivorous pitcher plant, as well as abundant wildflowers, skunk cabbage and large boulders dot the grassy field. Back on the trail, the route contours around the edge of the meadow, heading uphill to the north before turning to the east, meandering through the woods right on the edge of the grass. It is possible to hear the springs gurgling from some points on the trail. To the south, beyond the meadow, the rugged cliffs rising above Tamarack Lake are visible, as is Baker Peak, the cliff’s highpoint. There is a rugged route to the Grey Rocks’ south summit from here, but it is difficult and involves significant bushwhacking. Looking down on the Grey Rock Meadow Trail. Past the meadow, the trail begins to a long, gradual descent down to a saddle above Grey Rock Lake, though the lake is not visible from the trail. From here the old, narrow road makes a sustained descent through extremely brushy terrain as it travels down Flume Creek Ridge toward I-5. 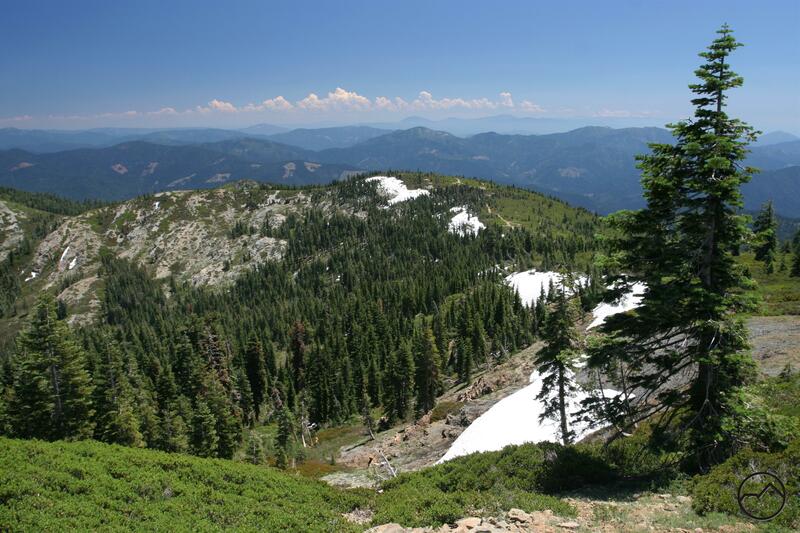 This is a long, interesting trek that boasts some fantastic views of the Castle Crags and Mount Shasta. The trail does not lead directly to the interstate though. It is necessary to navigate a few short sections of dirt roads in order to reach the end of the journey. From Mount Shasta, travel south on Interstate 5 and take the Castella exit. Turn right onto Castle Creek Road. After climbing 3,500 feet in 11.5 miles, you will reach at Whalan Summit. Pass the road on the right leading to the Pine-gri-la resort. Continue another mile, then turn left on Forest 38N17. 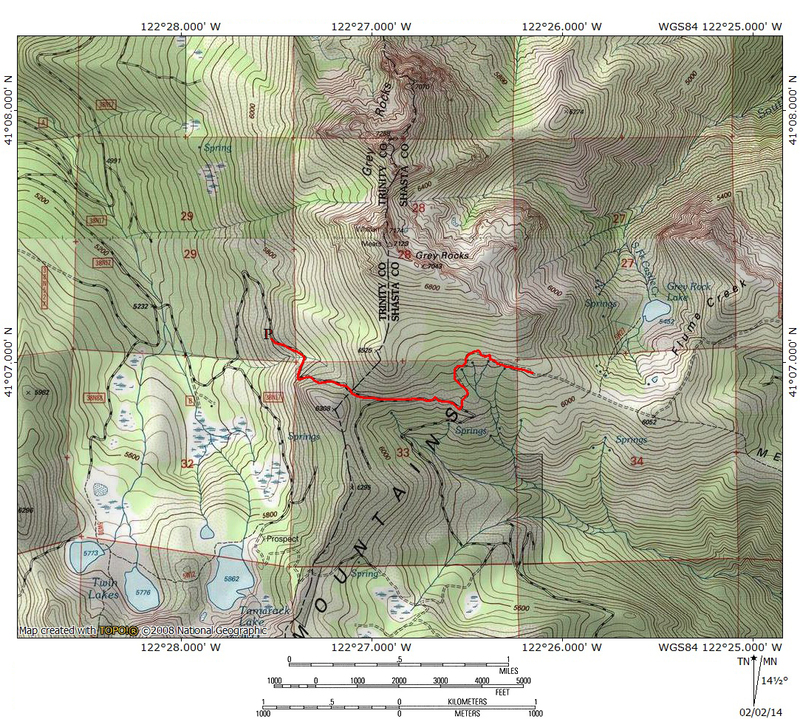 Follow the road for about 4.5 miles, crossing Twin Lakes Creek twice, to an obvious fork. Go left at the fork and continue one more mile to another fork. Park here and follow the road to the right on foot. We did this today. The directions were a bit confusing, and the road was washed out in areas. We finally pulled over and walked in due to a large wash out. I was driving a Subaru. A higher clearanced vehicle could have made it. The meadows were beautiful, but be aware it was quite a bit of effort. 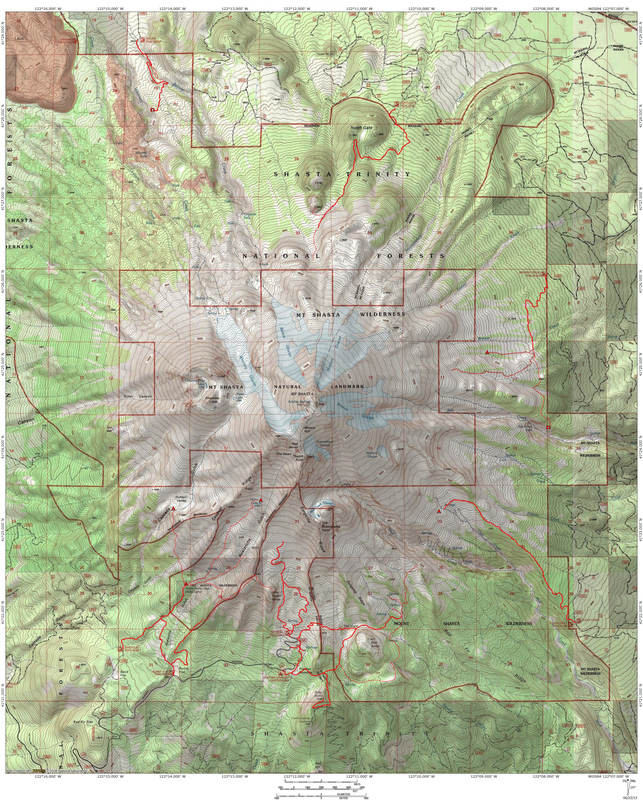 I think there are far better hikes chronicled on this website. We’ve done several and loved them all and would do them again, however, I probably wouldn’t do this one a second time.